Celebrate this festive time of year with fellow Solos guests in the beautiful town of Windsor! Often regarded as one of most beautiful Georgian buildings in Windsor. our elegant, historic hotel is the perfect base for our Christmas break. Enjoy Christmas with festive food and cheer in the company of new friends! Stay in a building that dates back to 1528! Just a couple of minutes walk from Windsor Castle's main gate, our elegant boutique style hotel is our home for 2 nights as we celebrate the festive season. Our arrival on Christmas Eve will be greeted with a welcome drink and delicious mince pies, before joining other guests for a buffet dinner served in the historic ballroom, accompanied by live music. The big day includes a traditional Christmas lunch with live entertainment, the Queen’s speech, Christmas cake later in the afternoon and a light supper. On Boxing Day, we can check out and perhaps explore Windsor further with a stroll into Eton, hitting the Boxing Day sales or grabbing a coffee in one of the many trendy cafés. 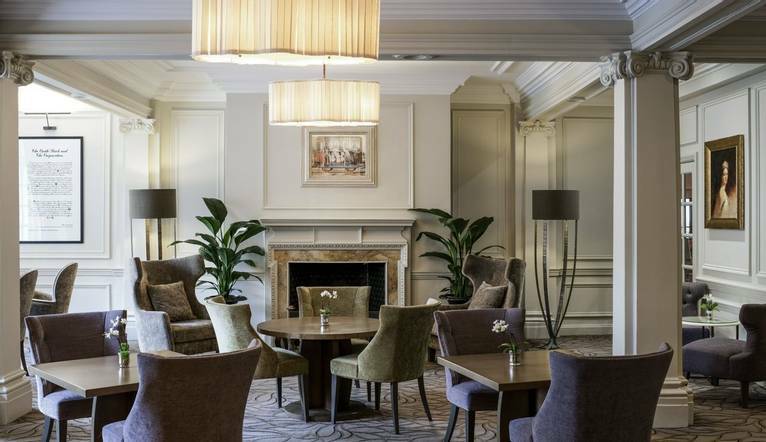 Located in the heart of Windsor on its wonderful High Street and opposite Sir Christopher Wren’s Windsor Guildhall, this hotel oozes history and a touch of boutique luxury. Having begun life back in 1528 as a cider and beer brewery, the hotel has grown in popularity and style through the years and was soon the grandest hotel in town, even hosting the Duke of Wellington after his victory over Napoleon. This elegant hotel features some fabulous views over Windsor as well as a restaurant and bar. Our classic rooms are all en-suite, elegantly decorated and offer flat-screen TV, tea/coffee making facilities, hairdryer, ironing facilities, bathrobes and slippers, complimentary mineral water, toiletries and free Wi-Fi. The hotel is easily accessible from the M4 motorway and Windsor and Eton Central Railway station is 350 yards away. Private parking is available on site at a charge on a first come first serve basis of £20.00 per night.